72 hour cancellation policy. We take a one night room and tax deposit at the time you make your reservation. This confirms that we will hold your room for you. The deposit is fully refundable if you cancel 72hrs prior to scheduled date of arrival. You can call, email or cancel via Facebook. If you fail to cancel 72 hours in advance, we will keep the deposit. For multiple night bookings, we will keep the deposit and automatically cancel all remaining nights of your reservation. Prices and Taxes: All prices are pre-tax. We have 2 fees and 2 taxes at Sunwapta. These come to a total of 13.2% on accommodation. When you're here, our restaurant and gift store prices are pre-tax. The total tax in the restaurant and gift store is 7.1%. Gratuities are optional and at your discretion. Payment Terms: We automatically charge the first night at the time of booking. If you are only staying one night, you have already paid! If you are staying multiple nights, we will take the remaining amount due for accommodation at the time of check in. If for any reason you want to shorten your stay, please talk to a manager so we can attempt to resell the room and provide you with a refund for unused dates. Traveling with Minors: The minimum age to stay in a room without adult supervision at Sunwapta is 20 years of age. If you are traveling with minors (under 18 years of age), you must have at least one adult staying in the same room. Accessibility and Special Needs: We do not provide wheelchair accessible showers or bathrooms. We understand this is a limitation and a let down and apologize. We do have a couple of wheelchair accessible rooms however. It's best to contact us directly by email or phone to discus your needs and determine whether we are the right property to stay with! We answer our own phones and emails, so you will always be getting direct and reliable information. Dispute Resolution/Problems: Our mission statement is to provide the best experiences that we can. If you have any issue whatsoever prior to arrival please contact us directly via phone or email. Email allows a written history, so we always advise this form of communication if you have issues with your booking. Once you arrive we are 110% committed to you and the people you are traveling with. There is no problem that we won't solve. Please come to the front desk to speak with us right away. Our Commitment To You: If for any reason AT CHECK IN, you are unhappy with the property, rooms, amenities or any other aspect of your experience, we will refund your charges and help you find a place more suitable to your needs and desires! Use of Personal Information: By using our online booking engine, or communicating with us digitally by email, online messaging interface, text message, online chat or social media, you are explicitly allowing direct digital communication in all the named formats as well as phone calls from Sunwapta Falls Resort LTD. Sunwapta Falls Resort LTD operating as Sunwapta Falls Rocky Mountain Lodge is family owned and operated business. We are here to help our customers connect with nature and create incredible experiences to last a life time! We will NEVER use your information except to communicate directly with you about your stay, your experience or other services we can provide to you before, during or after your stay. If you wish, you can follow us on Facebook for specials and events. We will never sell or share your information with ANY company outside of Sunwapta Falls Resort LTD except for non-personal non-identifying information used to help government agencies understand trends and statistics in tourism. Liability: Sunwapta Falls Resort LTD shall not be held liable for the use of this booking site or any other booking site on which our property is listed. The information provided here is done in good faith and to the most accurate level possible. If the you, the client, is not clear or have any questions you would like to ask, it is your responsibility to ask prior to making a reservation. Sunwapta shall not be held liable for any information provided on this site, or for the interpretation and decisions made based on that information. The client, you, are 100% liable for your travel plans. You are also completely liable for insuring your travel plans against financial loss due to any unfortunate events that may prevent you from coming to Sunwapta. We highly recommend purchasing full travel insurance that includes medical, trip cancellation and trip interruption to help ameliorate any unfortunate events. Sunwpata Falls Resort LTD is not your fiduciary. Please speak with your direct insurance advisor about your options. Sunwapta Falls Resort LTD is not liable for any incidents outside of its direct control that may effect your reservation or ability to fulfill it. Force Majeure: Sunwapta Falls Resort LTD shall not be held liable for any aspect of any force majeure event which prohibits Sunwpata Falls Resort LTD from performing its services. Opt in to receive deals on accommodation and promotions in our restaurant and gift store! You're always guaranteed the best rates booking direct with us. Feel free to share any promotions with friends, family, co-workers or anyone you like! If your inbox is full all the time but you'd like to stay updated, simply follow us on Facebook or subscribe to our Facebook chat! We'll post our specials and promotions along with beautiful images and video of course! How does staying in the middle of gorgeous wilderness, nestled by mountains, rivers, falls and lakes sound? Breathe that mountain air, and take a stroll or a bike ride to the falls just down the road. Enjoy an intimate dinner in our heritage lodge with crackling fire and mountain views as you reminisce over the unbelievable day. Truly relax with your loved ones and let us take care of all the planning, activity booking, and organizing your time in Jasper. 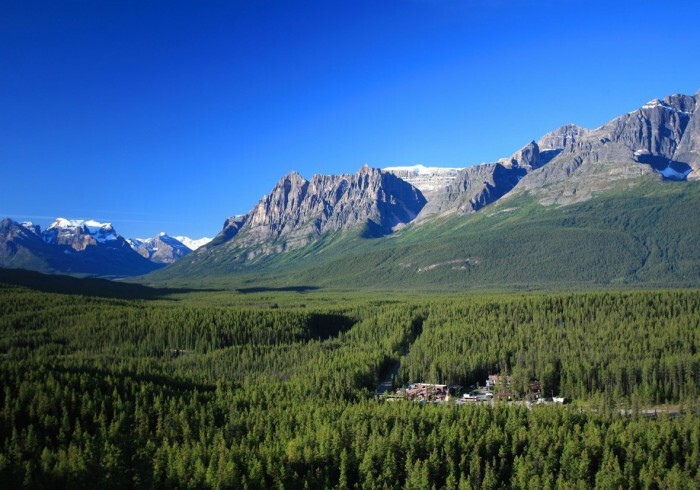 We're 53km south of downtown Jasper literally in the heart of Jasper National Park along the world-famous Icefields Parkway. It's a fantastic location! It's the biggest reason most guests pick us, but it's the services we provide that no one else does, and the spectacular dining that has won us TripAdvisor's Certificate of Excellence 2012 - 2018. We hope you will join us here in paradise. We are usually 85% full for the summer by April but HERE only you have FULL access to all of our rooms, and also the best rates. Please reach out if you have any questions. We answer our own phones, emails and Facebook messages. Take advantage of our 72 hour cancellation policy and book early! 1-888-828-5777 / info@sunwapta.com, or reach out to us on social media @SunwaptaFalls.